MARAT, JEAN PAUL. (1743-1793). Swiss-born, French physician, journalist, and revolutionary. ALS. (“Marat, l’ami du Peuple”). 2/3p. Small 8vo. Paris, November 4, 1791. 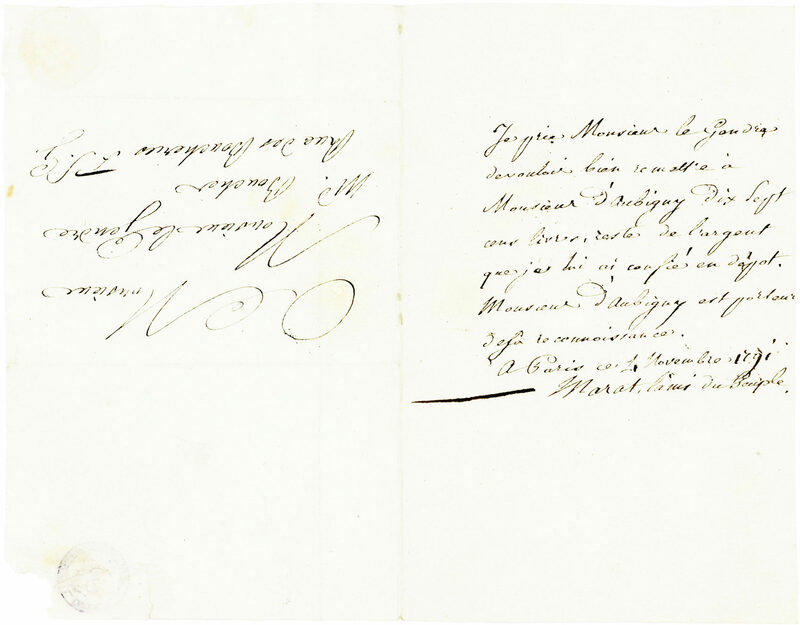 To revolutionary LOUIS LEGENDRE (1752-1797). In French with translation. As France marched toward revolution, Marat quit his scientific and medical career to begin printing tracts and newspapers criticizing the monarchy and its supporters. He published his L’Ami du Peuple (The Friend of the People) from September 12, 1789 until his death. He suspended publication only when forced into hiding in London or the sewers of Paris that exacerbated his debilitating skin condition. “Above all, a journal of denunciation,” L’Ami spared no one save Robespierre, (Histoire et Dictionnaire de la Revolution francaise, Tulard, et. al.). 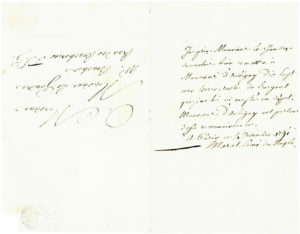 The daily eight-page issue offered Marat’s radical and violent solutions to the bankrupt social order. Ironically, its relatively high price precluded a popular readership; instead, its opinions were disseminated through public readings in clubs, cafes and even the garden of the Palais-Royal. Marat was a member of the Club Cordeliers (officially the Society of the Friends of the Rights of Man and of the Citizen), one of several important political associations to arise during the French Revolution, the most famous of which was the Jacobin Club. 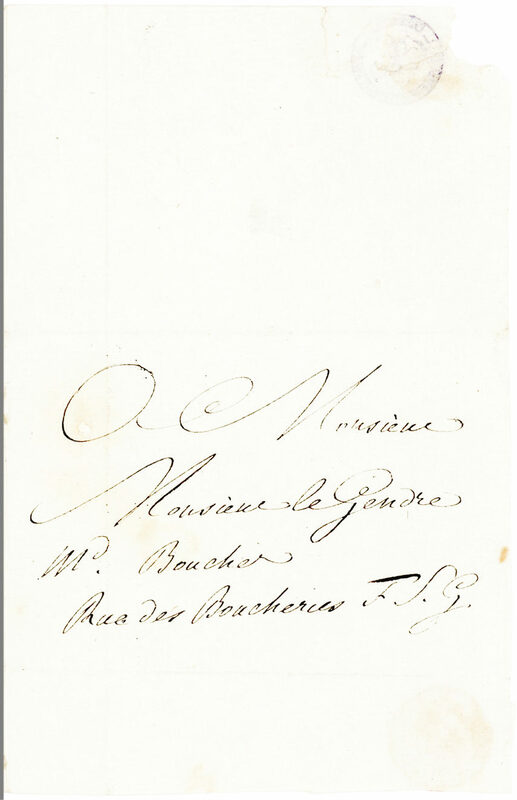 Fellow members of the Club Cordeliers included Camille Desmoulins, Georges Danton and the recipient of our letter, Legendre, a butcher and revolutionary who was a leader of the Storming of the Bastille. In July 1791, the club held a demonstration against King Louis XVI on the Champs de Mars, led by Danton, Desmoulins and Legendre. With thousands of protestors in attendance, the mayor of Paris declared martial law and the Marquis de Lafayette, then head of the National Guard, repeatedly attempted to disburse the crowd. The mob started to throw stones, and Lafayette ordered his troops to open fire leading to the Champs de Mars Massacre. As a result, some political clubs were shuttered, L’Ami du Peuple banned, and Marat was sent into hiding once again. 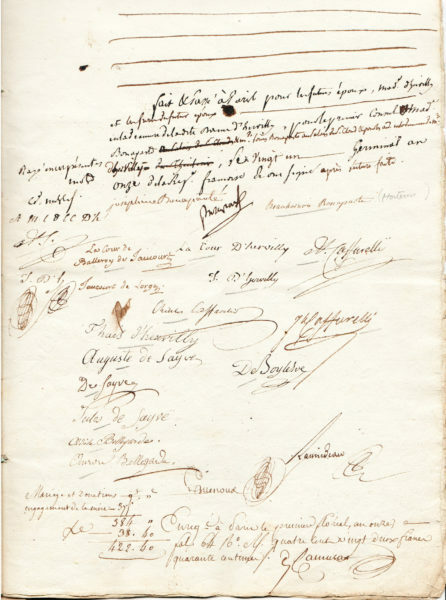 In 1792, Marat became a member of the National Convention and following the declaration of the French Republic he named L’Ami du Peuple the journal of the republic. 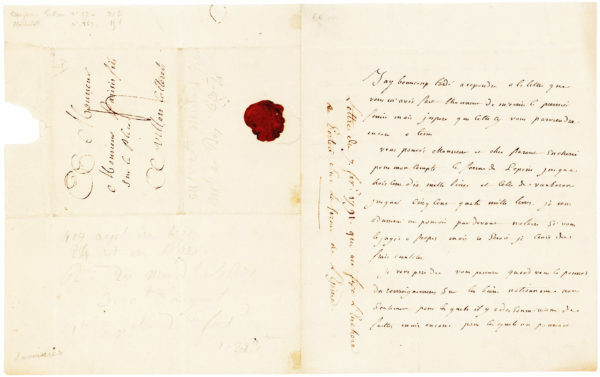 But poor health led to his retirement and, in July 1793, while soaking in a therapeutic bath, he was stabbed to death by Charlotte Corday, effectively transforming him into a martyr and intensifying the bloodshed during the Reign of Terror. His assassination was immortalized in Jacques-Louis David’s famous painting. Legendre participated in the August 10, 1792 attack on the Tuileries Palace, and as a member of the National Convention voted for the execution of Louis XVI, remaining loyal to Robespierre until the Thermidorian Reaction. He later served as president of the Convention, member of the Council of Ancients and Council of Five Hundred. 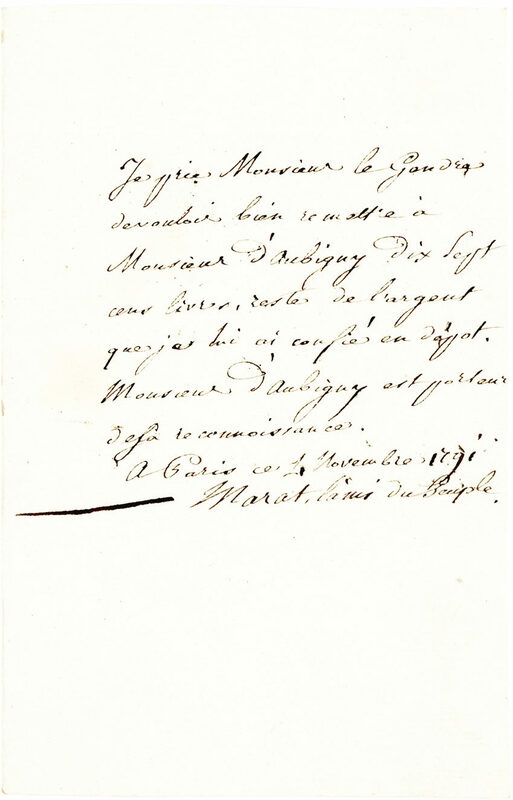 Our letter instructs Legendre to pay money to Mr. D’Aubigny, possibly Jean-Louis-Marie Villain d’Aubigny (1754-1804), a lawyer, revolutionary, Jacobin, and associate of Robespierre and Danton. 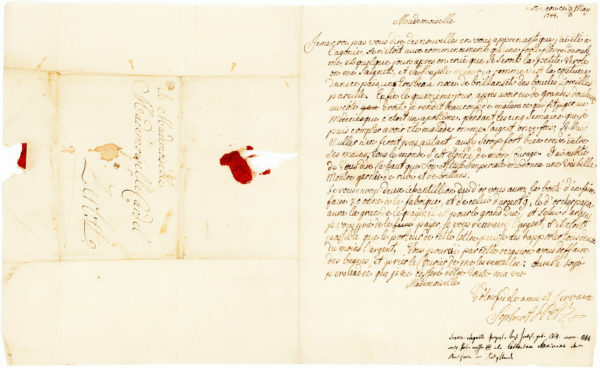 Written on a folded sheet with the intact integral leaf addressed in Marat’s hand with remnants of a red wafer wax seal. 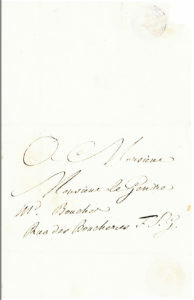 Ink collector’s stamp of Dr. L. Boehringer of Mannheim on the integral address leaf’s verso. In very good condition and rare.